Eddie Guerrero‘s impact on the wrestling business simply can’t be understated. His run in WCW and in his later WWE years are most remembered. 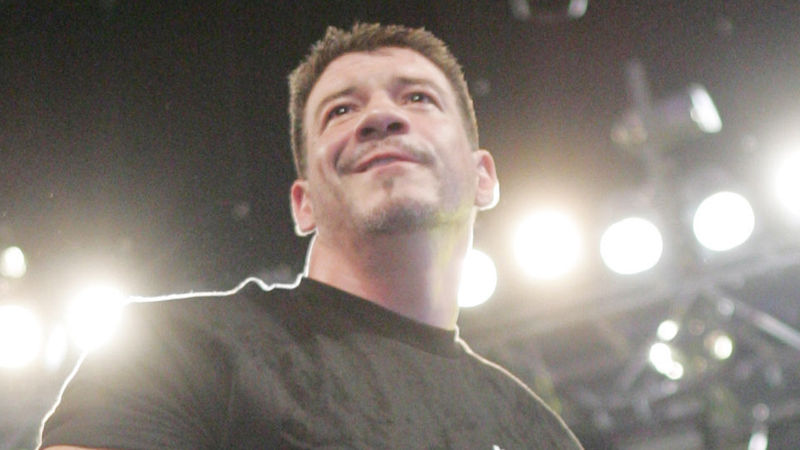 In 2005, Eddie Guerrero had finished his time in the World title scene. We all remember the miracle of 2004 at No Way Out, when Guerrero defeated Brock Lesnar to become WWE Champion. To date, it’s one of the most celebrated moments of the era, and that was the very night that inspired Sasha Banks to become a wrestler. Coincidentally, Sasha Bank‘s real-life best friend Bayley also happened to be in the crowd that very night. Guerrero went on to WrestleMania 20, where he defeated Kurt Angle in the most Eddie Guerrero way possible to retain the WWE Championship. However, a few months into his run, Guerrero was not happy. He was a very emotional man who took things very personally, according to Chavo Guerrero. In the case of his title reign, when he saw the SmackDown viewership wasn’t increasing when he was champion, he took it as a personal sign of failure from his end. He even reportedly asked Vince McMahon to take the WWE title off him, and he went all out in putting over JBL as a top heel champion. Guerrero didn’t enter the WWE Championship picture after that, but much of 2005 was spent associating with Rey Mysterio, who he had a friendly opening match with at WrestleMania 21 and a grudge match at SummerSlam the same year. Who can forget the “custody of Dominick” storyline? It made many people uncomfortable, but that’s mostly the last storyline that Guerrero is remembered for. What many people overlook or forgot was the fact that there was a redemption arc that happened right after, a rivalry-turned friendship with The Animal Batista prior to his tragic passing. Their friendship on-screen was very much based on real life, with Batista going as far as claiming that Guerrero was his one true friend in the locker room during that period, and Latino Heat had stood up for him on many occasions. Post his feud with Rey Mysterio, Eddie Guerrero actually entered the World Heavyweight Championship picture. But it was no regular rivalry. In fact, Guerrero tried to be as respectful as possible to The Animal during their feud. Guerrero proclaimed himself to be Batista’s friend, and did everything in his power to try and gain Batista’s trust, going so far as to help him in his matches. Guerrero hadn’t technically turned face yet, but the seeds were being planted. Batista reluctantly accepted him as his partner, but he was wise enough to know not to fully trust Guerrero. After all, his prior feud involved him trying to destroy a family. Batista would constantly test Guerrero to see if he was still using his “Lie, Cheat and Steal” motto. That was the biggest question heading into their World title match at No Mercy – Would Guerrero try to cheat his way into a World Championship, or was he truly the changed man that he claimed he was. Guerrero would have a seriously underrated contest with Batista. There was a spot where the referee was down, and Guerrero had an opportunity to use a steel chair and attack Batista to win the World title. Guerrero was visibly torn in half, between doing what was right or winning the big one again. Ultimately, he would go against his judgement and not cheat, trying to win the match the fair way. Unfortunately for him, it would cost him the match and Batista would retain the championship. But in the end, he and Guerrero would walk out with a lot more respect towards one another. What’s even more incredible to think about is that Guerrero wrestled the way he did while being under serious pain. It would turn out to be the final PPV match of his career. He finally turned face and then revealed that he was aware of the downfall he went through that year. He attacked his best friend Rey Mysterio and went through a darker phase after losing the World Championship. Their alliance would continue, but as we’re well aware, the storyline was cut short because Guerrero had passed away. In his last-ever match, he faced Mr. Kennedy and won the match in his typically sneaky fashion, getting qualified for the Survivor Series team. Since Batista was injured at the time, it was later revealed that on the date of his passing, he was supposed to face Batista and Randy Orton in a Triple Threat match for the World Heavyweight Championship. He was also supposed to win the World Championship, but it never came to be. Guerrero’s final storyline undoubtedly did great justice to him, as fans loved to cheer him a lot more than they liked to boo him.